Metallica swiftly make big improvements here. Coming straight after the amateurish, poor thrash-abouts on "Kill 'Em All","Ride the Lightning" is about one trillion times better. The attack here is much more professional, and there's much lessin the way of boring, amateurish thrashabouts. One significant improvement is in the area of guitar, and especially in the area of riffs. The riffs on "Kill 'Em All" gave absolutely no inkling to what came here - you can see the improvement straight away on the opening "Fight Fire With Fire", which begins with one of the all-time metal riffs. Metallica have also pretty much perfected the art of harmony - after a pretty standard thrash solo, Hetfield and Hammett launch straight into some ridiculously well-done and intricate guitar harmonies that make Thin Lizzy look like child's play. Not that they're better than Thin Lizzy - but they're definitely more intricate. This is the background for most of the other thrashers here - great riffs, and excellent strong structure. "Fight Fire WithFire" is perfectly backed up by both the brain-mashing title track, and "Creeping Death". Plus, they also prove that they'reas evil in a slow setting as they are in fast, with the classic "For Whom The Bell Tolls". Only the dull "Escape" and thecheesy "Trapped Under Ice" throw the band back to the days of "Kill 'Em All". There are still a couple of problems - but they're pretty much the problems that any Metallica album would have to live with.Lars Ulrich is still a generic metal drummer who doesn't have any of the mind-numbing fills that his rival, Dave Lombardo would show. And James Hetfield's lyrics are still set to stupid, but that's no real surprise. Hetfield's voice has significantly improved - his voice must have broken, as he has now developed the gruff voice that would be at the forefrontof pretty much all the recordings from now on. Cliff Burton is still your basic metal bassist, but it's not like you canever really hear him, especially not if Fleming Rasmussen, a terrible producer, is sitting in the chair. And Hammett's improved as well - delivering several excellent solos that aren't just boring thrash-abouts. In fact, his workouts on "Ridethe Lightning" and "Fade to Black" might be his two greatest solos ever. Anyway, to the other two songs. There's two big epic numbers on here - both better than all the other tracks here. Of course, there's "Fade to Black", which is basically their own "Stairway To Heaven". A multi-parter, beginning with slowsections alternating with big crunching riffs, some good guitar harmonies and culminating in an outstanding outro solo. Not as good as Stairway to Heaven, but it's still deserving of the "Metalli-classic" title, and amongst fans, it's arguablythe greatest song the band ever did. But it's actually not the best song on here - for me, that title would go to the overlooked "Call of Ktulu". It's mainlyoverlooked because it's directly in the shadow of "Orion" - which is pretty easily their best instrumental work. "Ktulu"doesn't nearly go through as many parts as that classic, but it's a great exercise in repetition. The picked riff buildsup constantly, forever adding new dimensions. We get a good Hammett solo, and a big, booming ending. I don't know why it'smy favourite - it's not the best-developed piece on the album, and it's extremely repetitive. But it's all about the build-up - building everything up to a big ending. Excellent work. I'll give the album a 7 - there's a couple of stinkers, but not enough to deny this album a good score. Great album, and amassive improvement to boot. Metallica's second album, and to me, a good album, but just an average Metallica album. 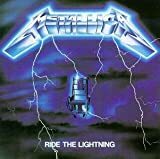 "Ride The Lightning" has several great songs on it. Songs like, "Fade To Black," "For Whom The Bell Tolls," and "Escape" highlight the album, but those are just three of the eight songs on the album. It is short, but each song averages six minutes or more, which makes it a longer album than many bands who put 16 songs on an album. The only problem, as is the problem in their debut album, "Kill 'Em All," James Hetfield's voice sounds like he just hit puberty, or as though he will very soon. The music is great, but the singing just doesn't fit. This is a very strong album, but there are others that you should get first, if you're interested in Metallica. one of the best metal albums of all time. the thing that made metallica so great back then was that they put thought into their compositions, and these are really well thought out. a HUGE improvement over the dumb debut, i thank cliff burton for this. the genius of the band. Great ALbum. Once again, don't compare this album to the "Black Album," it sounds nothing like it. This is what we "TRUE" metal heads, yes the metal heads who basically grew up during the 80's who actually bought this album on cassette or vinyll when it was FIRST released, refer to as trash, yes trash in it's purest form. The black album you ask? The Black album was a product of MTV and Bob Rock. It's trash in it's most watered down stage - right, this is the stage when the taste of money consumes the taste of purity and originality. Anyone who gives this album a poor review is most likely a "BLack Album/top 40" fan who basically jumped on the Metallica band wagon once the "black album" was released in 1990. Take it from a true metal fan who lived during this time - this album was, is, and will always be one of the greatest trash albums of all time, hands down.